In 1930 Japan signed the London Naval Treaty, imposing limits on cruiser, destroyer and submarine tonnage at the same 10:10:7 ratio to which the United States, Britain and Japan had agreed in 1922 for battleships. Cruisers armed with 8-inch guns and those with 6-inch guns fell into separate categories, and so all three navies planned new classes of light cruisers armed with 6-inch guns. Size limits remained the same as for 8-inch cruisers, and so these new “light” cruisers would be as large as their “heavy” counterparts. The United States built its Brooklyn class with fifteen 6-inch guns in five triple turrets, and Japan planned its own Mogami class with a similar armament. Both navies also intended to replace the turrets with new ones each carrying two 8-inch guns at some future date, but in the United States this remained only a paper exercise. Japan went much further. Mogami, the lead ship of the class of four, was laid down in late 1931 as an 8,500-ton light cruiser with fifteen 6-inch guns and a designed speed of 37 knots. To meet the nearly insane targets for speed and armament on such a small displacement, Japanese designers employed extensive electric welding techniques, and gave her very little armor protection. Mogami (foreground) and two sisters, 1938. The Mogami class had a good reputation among Japanese sailors and became prime assignments thanks to much better living quarters than other cruisers. Unlike most other Japanese ships, they were air-conditioned, had steel-tube bunks in place of hammocks, cold water drinking fountains dispersed throughout the ship, and more extensive refrigeration space than other cruisers (meaning the crew ate much better chow). And like all Japanese ships, they had several pickle lockers in different parts of the ship, for careful study had found that a crew that ate pickles daily was more efficient than one that did not. However, the air conditioning system proved to be very noisy, and was not installed in subsequent ship classes. Mogami’s bow collapsed during her first deployment in late 1935 thanks to poor welding, and the crew found the hull had warped so badly that they could not train her turrets. An investigation board ordered her disarmed and drydocked for extensive reconstruction. She received new riveted steel plates amidships along her sides as well as a new double bottom along the keel. Mogami and her sisters also received new bulges, increasing her displacement to over 10,000 tons and dropping her speed by several knots. Her twelve 21-inch torpedo tubes gave way to a dozen 24-inch 93 Shiki (“Long Lance”) tubes, though reloads dropped from 12 to six. She emerged in February 1938 as a much more efficient warship. But even while she still lay in drydock, new 8-inch turrets had been ordered for the class. She was not fully commissioned before being sent back into the Kure dockyard in December for re-armament with 8-inch main guns, finally re-joining the fleet in April 1940. While the cruiser Chokai had been tagged as the Imperial Navy’s lucky ship, Mogami had a reputation for ill fortune. She suffered typhoon damage during her first deployment in September 1935. When war broke out, she helped cover landings in Malaya and Borneo, and then moved on with her squadron to the operations in the Java Sea as shown in Strike South. On 27 February 1942, Mogami and Mikuma were covering landings in Banten Bay on Java. On the next evening, they were attacked by the combined Allied cruiser force. The two cruisers sank the American heavy cruiser Houston and the Australian light cruiser Perth, but during the course of the action Mogami confirmed her status for all Imperial Navy sailors. She fired a spread of six “Long Lance” torpedoes that proved to be one of the most devastating of the entire war: they sank the Japanese Army landing ship Ryujo Maru, the Army transports Sakura Maru, Tatsuno Maru and Horai Maru, and the Navy minesweeper W-2. After a refit in Japan, Mogami’s squadron was assigned to the Midway operation as close support for the invasion force. At midnight on 5 June, the squadron was ordered to carry out a nighttime bombardment of Midway Island the next evening; the cruisers were about 90 miles from the island when sanity prevailed and the bombardment was cancelled. But at 2318 that night a lookout on the squadron flagship Kumano spotted a surfaced submarine, and the flagship ordered an emergency turn. During the turn, Mogami rammed her sister Mikuma on the port side below her bridge, leaving a huge gash in Mikuma’s oil tanks. A massive oil slick spread behind her. Mogami’s bow crumpled, bending back almost at a right angle all the way to her forward 8-inch turret. Her speed dropped to 12 knots. Kumano and Suzuya headed off, while the two stricken cruisers and two destroyers made the best speed they could, rising to 14 knots four hours later. The planes came at dawn. Twenty-six dive bombers struck at 0645, hitting Mogami twice. Fifty-four appeared at 0930, hitting Mogami twice more but concentrating on her sister. Mikuma took at least five hits; one started a fire in her torpedo room and the Long Lances exploded. With the captain gravely wounded, the first officer ordered the crew over the side. The ship sank later that day. Mikuma following American air attack, 6 June 1942. Two dozen more bombers attacked at 1145, hitting Mogami on her aircraft deck and sealing the hatches to her engine room, killing the entire “black gang” trapped below. Mogami survived with 90 killed and 101 wounded, limping back to Truk and — after five weeks of temporary repair there to make her seaworthy — to Sasebo Navy Yard. Mogami stayed at Sasebo from August 1942 until April 1943. She was rebuilt as an aircraft cruiser, with her two aft turrets (one of which had been destroyed at Midway) removed and her aircraft deck extended all the way to the stern. She also received a greatly increased anti-aircraft armament, and air search radar. In her new guise, she had a capacity of 11 seaplanes. The old armored barbettes under the turret rings became bomb-stowage areas and gasoline tanks for the seaplanes, and her fuel stowage was also increased. Re-commissioned in May 1943, Mogami trained for three weeks before receiving orders to join the fleet preparing to sail for the Aleutian Islands in response to the American landing on Attu. While in Tokyo Bay preparing for this mission, her bad luck returned when she rammed the oiler Toa Maru. The Aleutians operation never took place, and Mogami transported Army troops to Rabaul in July. She remained at Truk with the Combined Fleet until early November, when she was ordered to Bougainville to attack American ships there. Staging to Rabaul, she was attacked there by a single dive-bomber from the American carrier Saratoga, which hit Mogami between the first two turrets. A severe fire broke out and the crew had to flood both magazines, submerging the cruiser’s bow. Mogami went back to Truk for emergency repairs, which lasted over a month. From late December 1943 until 17 February 1944 she was under repair at Kure Navy Yard. The aircraft cruiser participated in the “Sea Battle off the Marianas” (Battle of the Philippine Sea) without suffering damage, but without contributing much to the Japanese cause, either. Thanks to material shortages, she only carried five seaplanes. When she set sail for her last engagement, she had eight planes aboard. Mogami was part of Adm. Shoji Nishimura’s Force C that attempted to penetrate the Surigao Strait on 25 October 1944 and attack the American beachheads in Leyte Gulf. At 0350 she was hit by two 8-inch shells, and responded by firing a spread of torpedoes and turning about. As she turned, another shell struck her bridge, killing Capt. Ryo Toma and most of his senior officers. With the gunnery officer in charge and her rudders moved manually, she attempted to escape at high speed. Once again, the cruiser’s bad luck re-surfaced and at 0430 she plowed into the heavy cruiser Nachi. The crew still had not managed to put out the fire started by the first shell hit, and a few minutes after the collision it spread to the ready-use ammunition piled alongside the midships anti-aircraft batteries. As the shells cooked off, the torpedomen began jettisoning their weapons lest they explode as well. Bad luck was still with them: At least one torpedo broke loose and rolled into the flames, and in all five warheads exploded. 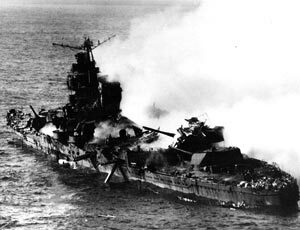 Mogami suffered massive structural damage; the entire crews of two of her four engine rooms perished immediately while that of another had to evacuate due to the extreme heat. 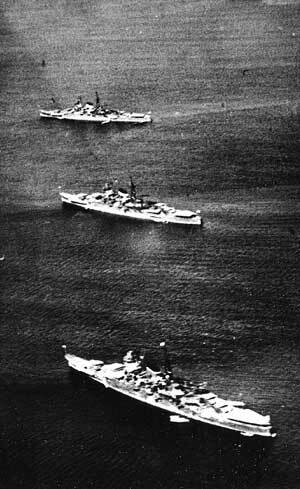 At 0530 three American cruisers (Louisville, Portland and Denver) made contact and hit Mogami between 10 and 20 times, but these did surprisingly little additional damage. Mogami rejoined Nishimura’s force, and the destroyer Akebono was detailed to shepherd her home. But at 0830 her last engine broke down and 30 minutes later American planes found the wounded cruiser. They hit her with two bombs, and new fires broke out in the forward parts of the ship. Damage control parties kept the ship afloat, but when they tried to flood the 8-inch magazines, they found the valves too badly damaged. Fearing a magazine explosion, Mogami’s gunnery officer ordered her abandoned. Akebono took off her crew, and sank the wreck at 1240 with a single torpedo. Mogami appeared the Second World War at Sea series in her heavy cruiser configuration, in Midway Deluxe Edition, Eastern Fleet and Strike South. As an aircraft cruiser, she made an appearance in the long-out-of-print Leyte Gulf. Click here to order Strike South right now.